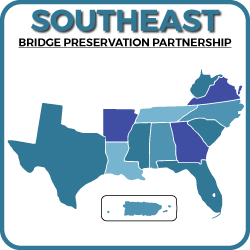 The Southeast Bridge Preservation Partnership (SEBPP) is comprised of representatives from regional state and local highway agencies, provincial transport agencies, industry, suppliers, consultants, and academia. Any interested agency, organization, company, or group may join and participate in the activities of this Partnership by contributing funds to the American Association of State Highway and Transportation Officials (AASHTO), or by paying fees to attend the annual workshop and conference. Through the free and open exchange of ideas and information, the SEBPP’s mission is to better serve those who use the southeast transportation system. We will strive to use innovation, new ideas, new products, and our combined experience to make our bridge maintenance procedures and repairs the best that can be provided. Together, we will take bridge maintenance in the southeast forward toward excellence and, through teamwork and cooperation, increase morale and bring a positive sense of accomplishment to the team members of our bridge maintenance departments.